ULOG - My Entry To Ulog-Quotes Contest by @surpassinggoogle. This is my first time to post a #ulog. I will be joining the ulog-quotes contest by @surpassinggoogle. "Please Don't Delay Fresh Ulogs Inside." 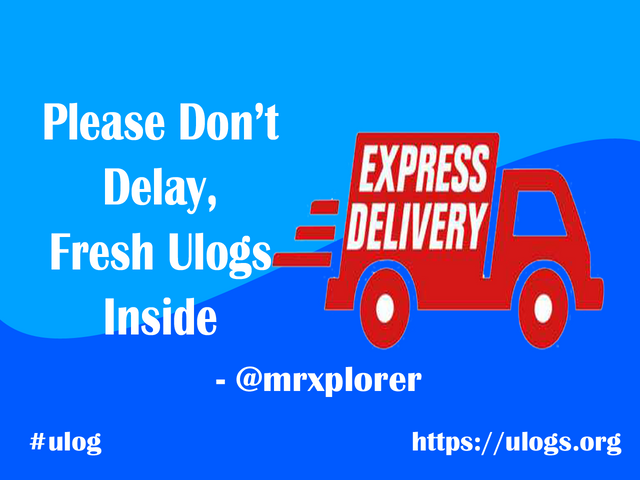 From now on I will be delivering to all #uloggers fresh and new ulogs from my daily experiences and explorations. I will be traveling around the Philippines to give you fresh #ulog-photography and #ulog-videography. Let's make ulog very popular in the internet. Let's build ulogacy. I will also curating new quality #ulog post. I hope you will like my adventures and explorations now that I am your #ulog-geographer. See you on my next ulog.